Marge S. - Got my order today and they are delicious! The almond, cranberry, honey and cinnamon is wonderful! I ordered 5 flavors, hated to open them all up at once, but once I tasted one, I just had to taste them all! And they were all fabulous! I will be ordering more. Thinking these would make great Christmas gifts! Peggy A. - I found Cheryl's Nut Butter through a friend on Facebook. I'm so happy to have ordered them. They are absolutely the BEST I've ever eaten and I go through a jar of nut butter a month... These will go quicker they are so tasty. Give it a try you will be hooked! Leslie M. - Oh my stars!! These nut butters are AWESOME! The peanut butter with dried apples, honey and cinnamon is divine! I ordered five different flavors and they are the best nut butters I've ever had. What you get in the grocery stores do not even come CLOSE to these. I will DEFINITELY order again! Debra N. - Wonderful flavor and taste. Cheryl is very nice and will answer any question you have about her products. Ships as cheaply as possible, i.e., flat rate via US Postal Service. Mary J. 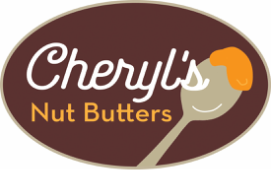 - Cheryls Nut butters are the best! They do not contain any additional oils or preservatives or anything artificial, and no added sugar either! I love peanut butter but found most commercial brands didn't agree with me. Then I sampled Cheryls Nut butters,and bought one. After that I became a repeat customer--great product, and great customer service. You can't go wrong with that! Rebecca K. - Just bought 5 different flavors at the Minneapolis Home & Garden Show on Friday and had to already go back today to replenish the spicy peanut butter... ❤❤❤ all of the flavors! Rhea T. - Saw and sampled at the Minnesota Horse Expo. I bought 5 jars! LOVE this product!!! So tasty, rich, and best of all Natural . Cannot say enough about this peanut butter. Plus it's made in Minnesota- yay!!! Teddi K. - Found you through a tribe member... WOW, you are right this will become addicting ! If you are on the fence, take my word for it and jump on in! Delish!